Almost nine years ago I visited the newly opened office of Google in Munich. Since then the team grew tremendously and has taken several buildings in the city of Munich. Now it’s time to get all of them under one roof and make space for more growth. This month Google Germany has moved into their new offices. Thanks Philipp for the tour. The japanese Knowledge Dynamics Initiative (KDI) sent a high ranking delegation to Europe in August 2008. The topic of the Knowledge Bechmarking Program is called “Driving Innovative paradigm management”. The goal of the management program was to exchange Knowledge-Management, to analyse best practice-examples, and to put knowledge into practice for their own organizational transformation. The program in Germany was organized by Ahead of Time and included several expert keynotes, company visits and networking events. The japanese delegation met and discussed with experts from BMW Group, Fraunhofer Institute, Swarovski, Nokia Siemens Networks, Siemens and others. “Monty Metzger and his team at Ahead of Time was the perfect partner for us. Their network, their experience for management travel and close connection to the industry leaders were essential for our benchmarking program. The participants profit from relevant knowledge, new energy and inspiration by meeting innovative leaders. We are looking forward to collaborating furthermore with ahead of time in the future”, says Yayoi Kubota, Head of the Knowledge Benchmarking Program at KDI Fuji Xerox. Ahead of Time is an international Innovation Agency and provider of high-level management exchange programs, such as Manager Tours. Fuji Xerox, a joint venture of Fuji Film and Xerox, provides digital imagine and printing equipment to the Asian market. Its products include digital printers, digital copiers, multi-function machines, projectors, engineering plotters, image processing systems, fax machines, and related software. management research organization in the world. With this partnership, KDI offers benchmarking studies of leading KM best practice corporations and research results of cross cultural approach in KM. We have studied 26 US companies, 15 European companies and 34 Japanese companies who demonstrated best practice in the field of KM and Innovation. During the “VDZ Online Publishers Tour” we organized in February 2008 we were invited to the German Embassy in Seoul for a Diner-Reception. The Speaker and Expert of this evening was Rick Kim, Country Manager Linden Lab South Korea and former Manager at Cyworld. 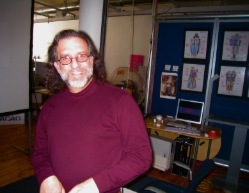 Linden Lab is the company behind “Second Life”, the 3D Multiplayer Virtual World. Rick is talking about the challenges and opportunities regarding Virtual Worlds in South Korea. He explains the key-success factors for starting such a project in Korea as well as insights about the korean consumer. 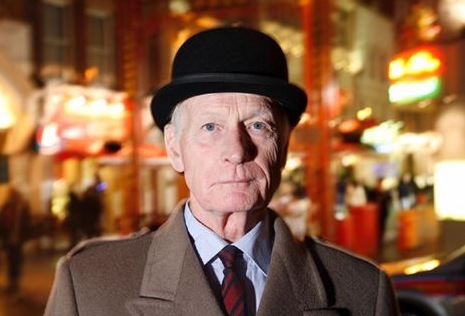 Yesterday I watched a great documentary called “Brits get rich in China”. The Video was recommended by Christine Lu from the ChinaBusinessNetwork. I think the documentary shows the dynamics and the spirit in China. As we are preparing our upcoming manager tour in China, the video is a great example of what you can experience in China. Furthermore you get a good feeling of “how to do business in China”. Another productive day in New York passed. We have again received a lot of positive feedback about the program of manager tours in April 2008. And we have more confirmed speakers which we will announce on the official website soon. I met David Polinchock from the Brand Experience Lab and he showed me their latest project and innovative projects. It si just amazing what they are doing in their brand lab in Soho. They will role out a great project called “audience games” in pver 700 cinemas all over USA. You can use emerging technologies to turn brand messages into brand experiences. David just quoted a attendee of one of the tests in a cinema to make clear how powerful the idea is: “Have you ever heard the audience scream “play the advertising again””. Furthermore I met Gaby from Gawker Media, the leading blogging company, and Sam from Interference Inc, a guerilla marketing agency. The manager tours program will be exciting. Today I met Gonzalo Vargas Llosa, Senior Policy Adviser (Advocacy and Communications) at United Nations Refugee Agency (UNHCR) in New York. At the upcoming tour in April we will do a short tour through the United Nations Headquarter and then talk about the “ninemillion” project. 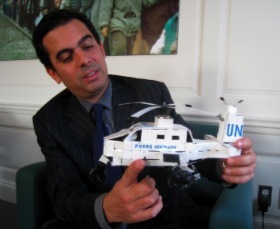 Mr. Vargas Llosa showed me a handmade UN helicopter build by children. He got it as a present during one of his projects. It is great to see that Corporate Social Responsibility is not only an innovative marketing issue, it is also a possibility to really help people in third world countries. We are currently working with full power on the preparations for the upcoming manager tours. It is really great to start a “conversation” with our attendees, speakers, experts and interested people who just follow our blog. During the whole preparation work we are integrating all ideas and feedback to create a really high-level program. 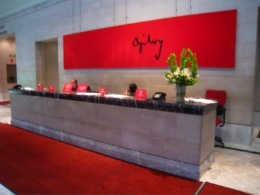 Yesterday I met Mike Hemingway, Global Managing Director at Ogilvy & Mather Worldwide, in midtown Manhatten. Mike will talk about his innovative marketing activities for the beauty brand “Dove“. The viral video “Dove Evolution” was watched by millions of people (over 6 million on youtube alone). I think it is the most effective viral marketing campaign so far and Unilever is really setting new standards to start a conversation with its consumers. 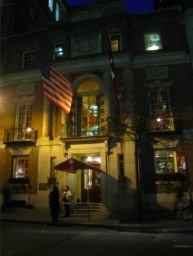 Today I met Andrew Heyward, former CEO of CBS News, at the Harvard Club New York to talk about the manager tour in April 2008 in New York. Andrew will talk about the changing media landscape, his experiences at CBS News and how you can prepare your company for the future of media. The manager tour in NY will offer a great program and I am really looking forward sharing it with you. Today I did an interesting Video-Interview with our TrendScout John Rajeski in Seoul, South Korea. We recorded it during the VDZ Asia Tour in February 2008. He is taking about the major trends in mobile media in South Korea and gives a short overview. Today is the first day of the VDZ Online Publishers Tour in Asia organized by CScout. The program starts in Seoul, South Korea. Here are just some notes about the morning. Danny Kim did a great kick-off about the web 2.0 scene in South Korea. Danny is famous Korean Web 2.0 Blogger and is a TrendScout within the CScout Network. He has just finished his book “Meconomy” and talked about cool new services from openmaru. One service is called springnote. Springnote is a wiki-based online notebook platform first developed in korean and now rolled out in english. He used sprindnote to write his book in close cooperation with the editors. He said it was a really great working experience and made the wirting process very time efficient. Our local TrendScout John Rajeski gave an introduction to the internet and mobile media market in South Korea. With roughly 10 Mio. inhabitant in Seoul, compared to 49 Mio. people in the country, the city plays a major role in digital media. John explained that you can get a 100MBits Internet connection at home for around 30 Euro per month. Via Wimax you have access to 3Mbits per second on the move within the City. GPS, 3G (UMTS) also play a big role for the korean market and is available since almost a decade. The reason why South Korea has such a powerful infrastructure is due to the consistent development by the korean government. Another important factor is that the korean consumers are very early adopters, they just love to try new services and applications. Furthermore the mobile phone is the most important access to the internet for the consumers. Therefore it is not surprising that there are 9 million mobile TV subscribers in South Korea, that is 18,75% of the whole population. S. Korea is the leader in Mobile Banking, Japan is a leader in Mobile Payments. Mobile banking in S. Korea has about 5 million active subscribers. The growth of the mobile banking market is very impressive. Further meetings today are for example Cyworld, LindenLab Korea. More pictures about the trend tour at my Flickr account.